This HiRISE image shows TARs near Schiaparelli Crater in the equatorial region of Mars. The TARs (lighter tones) seem to have a dominant SW-NE trend, suggesting that they formed from winds that blew from the NW or SE. The TARs are very young (or at least have been mobile in the very recent past) as there are almost no small impact craters visible on them. The natureof strange ripples of sand on the Martian surface is clearer now thanks to pole-to-poleimages returned by a NASA spacecraft. But even with this new information,scientists still are unsure just how the features, which are unlike anything onEarth, came to be. The ripplesare found over large swaths of Mars. They are smaller than the red planet'sgigantic dunes but larger than sandripple fields found on Earth. CalledTransverse Aeolian Ridges (TARs), these unusual features are formed bywind-driven particles (phenomena involving air movement are known as"Aeolian processes"). The winds blow the ridges into many shapes:simple ripples, forked ripples, snake-like sinuous waves, crescent shapes andcomplex, over-lapping networks. Scientistsstudy TARs because they hold clues to the past and present climate processes onMars, and because they can trip up NASA's rovers currently rolling around theMartian surface, as has already happened to the Mars ExplorationRover Opportunity. Matt Balmeof the Planetary Science Institute in Tucson, Ariz., and his colleaguesconducted a comprehensive pole-to-pole survey of more than 10,000 images ofTARs taken by the Mars Orbiter Camera, part of the Mars Global Surveyorspacecraft (which launched in 1996 and orbited Mars at least until 2006 when itstopped responding to signals), to gain more insight into the strange features. Are more common in the southern hemisphere of mars than in the northern hemisphere. Are found in an equatorial belt between 30 degrees north latitude and 30 degrees south latitude. Exist in two distinct environments: near layered terrain or adjacent to Large Dark Dunes (LLDs). Are abundant in the Meridiani Planum (a plain 2 degrees south of Mars' equator) region and in southern-latitude craters. Additionalinformation on TARs came from Opportunity's2005 encounter with one of the ridges. The rover was bogged down for sixweeks with its wheels firmly stuck in the sand. Opportunity's time stuck in the ridge showedthat at least this TAR was composed of an outer layer of granule-sized materialranging from about 0.08 inches (2 millimeters) to 0.2 inches (5 millimeters).Below that outer layer was a mixed mass of fine and coarse particles. TARs needtwo things to form, Balme explained: a supply of sedimentand strong winds. The sediment requirement helps explain why the features arefound near dunes and layered terrain, he added. 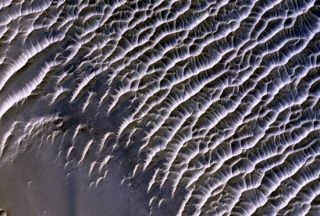 Both dunesand layered terrain (which could have been formed by ancient sand dunes, oceanor lake deposits, or layers of volcanic ash) provide the raw material for theTARs. Steepslopes can also provide additional particles for ripple formation as theyerode. This factor could explain why TARs are confined to a central belt aroundthe planet, Balme said, because steep slopes are not generally found in themiddle to far north and south latitudes of Mars. TARs alsocome in two age ranges: Those near layered terrain are generally severalmillion years old and inactive, while the ones near LLDs are young and maystill be actively forming and moving. "Mytheory is that the very young TARs are found near the Large Dark Dunes, whichare also very young, because the sand blowing off the dunes provides the energyneeded to form TARs," Balme said. "Meanwhile you have areas nearlayered landforms that used to have active sediment transport, but no longer[do]. This shows a dynamic environment that has changed, and we might be ableto use TARs as paleo-markers to help decipher ancient climates." Currentmodels that examine circulation patterns in Mars' atmosphere don't provide muchevidence that windpatterns and atmospheric densities on Mars were significantly different inthe past than from what they are now. "But Ithink the geology we are seeing suggests that there might have been differentpatterns and densities," Balme said. "The observations we're gettingnow from Mars Global Surveyor [data analysis] and the HiRISE camera (flyingaboard the Mars Reconnaissance Orbiter [currently orbiting Mars]) are giving usreally good data to drive the models." In additionto figuring out what processes formed the TARs, scientists also still don'tknow exactly what materials compose the various TAR fields or why they seethese large features on Mars, but not on Earth. "Overthe next couple of years we should be seeing many more images from HiRISE thatcan gives us more information, for example, about the heights versus spacingand whether TARs have more in common with dunes or the ripple fields found onEarth," Balme said. HiRISEimages of the fields taken over long time intervals could show small movementswithin some of the TAR fields, indicating which ones are still active andpossibly demonstrating how they form, Balme said.